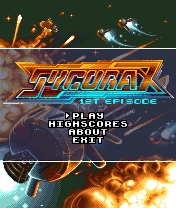 A real oldschool side-scrolling shoot'em'up with amazing graphics. 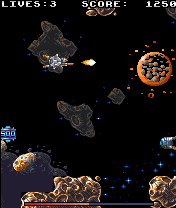 In the first episode the player takes on an alien infestation in an asteroid field. 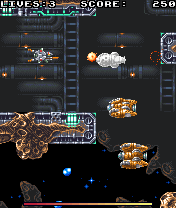 Try to fight off the alien waves and collect powerups to help you on your way! Joystick or numpad 2,4,6,8 to move. You can also move diagonally by 1,3,7 and 9. Right softbutton or # for menu. In menu use left softbutton or numpad 5 to select. Powerup container. Shoot this to gain one of the powerups below. Score powerups can also be dropped by some enemy waves. Increase fire rate. You can power up three times. Protective shield pod. You can have up to two pods active. All powerups also gives you a small bonus to your shield when you pick them up.